STRATHROY Harps have eventually confirmed that Benny McElholm will be the club’s new manager next season. McElholm was announced as the Harps new supremo on Tuesday evening with Paul McCabe, the former Omagh Hospitals boss, being confirmed as manager of the club’s reserves. 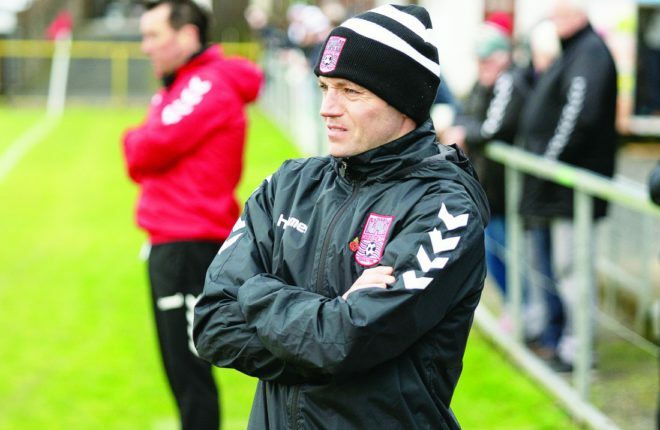 McElholm had been installed as the bookies’ favourite to replace the retiring Shane Horisk after he stood down as Tummery Athletic supremo some weeks ago. The former Leyton Orient and Omagh Town defender had guided the Dromore side to magnificent Mulhern Cup triumph before deciding to call it a day at Crawford’s Lane. At that point it had been widely predicted McElholm, who had captained Harps to Irish Junior Cup glory in 2012, was indeed on his way to Strathroy Road. Despite rumours that ex-Omagh Town chief Roy McCreadie was in the frame, this newspaper and the Ulster Herald Boot Room team forecast McElholm would be the next Harps manager although by his own admission there had been a number of “complications” during talks with the three times Mercer League champions. This week though the club announced that those talks had reached a successful conclusion and that McElholm would indeed lead their challenge next season. A club statement read: “We are delighted to announce and welcome home Benny McElholm to the Harps family. “Benny was part of The Harps team for years, captaining the team to our very first Junior Cup win. He was part of the team which went on to win back to back juniors and our very first Mercer League.